building. We have experienced, talented lesson and lease horses for beginner to intermediate riders who do not own a horse. Partial leases available. Advanced lessons and clinics are offered to leasers and boarders with their own horse. We attend 1-2 horse shows a month locally and out of state. Ask about joining our show team! 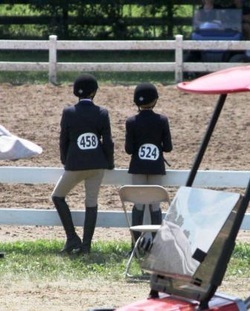 Our students are have competed successfully in everything from groundpoles to the 1.40m grand prix level. Our lessons are given in either our indoor or outdoor arenas depending on weather and the riders level of experience. Lessons are given year round. $50/lesson if a monthly minimum package of 4 or 5 lessons are pre-paid by the first of the month. If purchasing the discounted monthly lesson package, packages must be pre-paid by the first of the month. If package is not purchased by the first of the month, lessons are single lesson price. Make-ups need to be completed within the month. Please let us know if you need to reschedule your lesson. We charge for no shows and lessons not canceled with 24 hours notice. We accept cash or check at the first lesson of the package or credit card at the bottom of this page for a small fee. Riders are required to have paddock boots and an ASTM/SEI certified helmet. Hair needs to be put into a ponytail or put under helmet with a hairnet. We have helmets available for use if necessary. Breeches and half chaps are strongly recommended. No shoes with zippers up the inside of leg and no decorations on pants. Tank tops and V-neck shirts are not permitted. If not a current student, you must call Brittany at 317-695-4868 for lesson availability before submitting payment. Thank you.